Hey all and happy Wednesday! You know that quote from Mean Girls: “On Wednesday’s We Wear Pink!” I was definitely thinking about titling this post that, but I didn’t want to be too cliche! I really do love this pink dress though, and pink in general for spring. It’s been a crazy week, my power was FINALLY turned back on after fighting with Comed back and forth for a week about it. But, it’s back on and solved, so at least that is taken care of! I lovedddd this dress when I saw it in store… like I don’t say that about pretty much every dress I purchase haha. I am actually crazy picky about dresses, so when I find good ones, I get so excited about it! I really just loved the color of it, the pink was so vibrant, and the tiers of ruffles was also so unique! I love when dresses have a mix of textures or prints… so this was so fun for me! Of course, you know I have to find a good wall to fit every outfit, and I knew this one would be perfect for this dress! 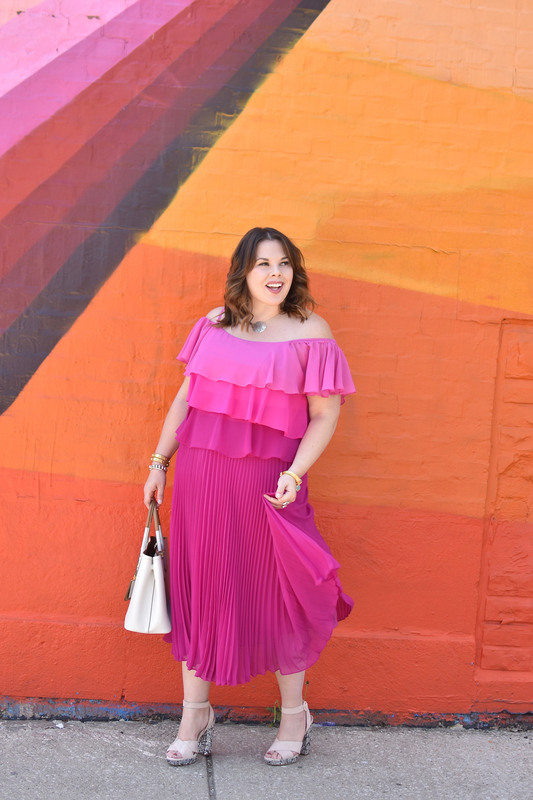 I knew that this one had the giant stripe of pink in the wall, with the layered colors, just like this dress! I thought the mix of orange and pink would be the perfect complement to this whole outfit! Oh this dress is so pretty! I am loving those heels too, so gorgeous! I love the wall you photographed with too, it’s so different! I’m glad everything is turned back on! Ok I totally need this dress in my life. I love the ombre effect as well! So pretty! I am loving this dress girl!! Love the ombre colors, so cute! 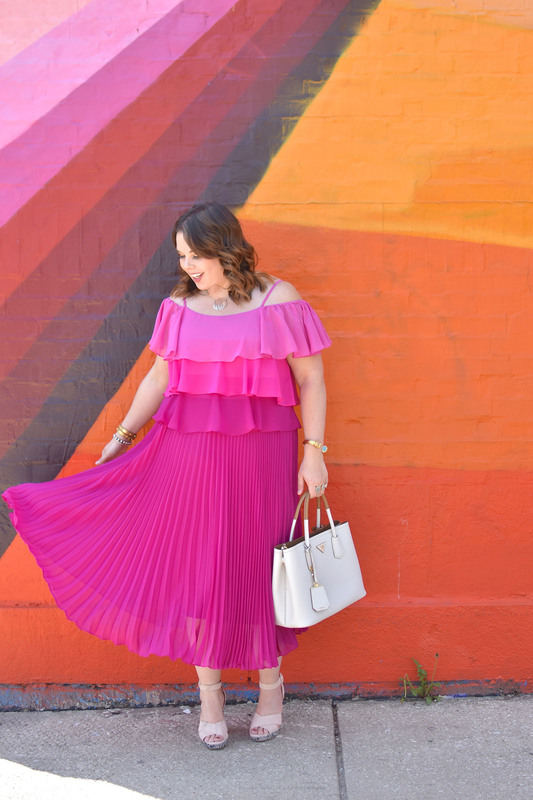 this pink ruffled dress is just gorgeous on you babe! so perfect for spring and summer, and looks airy and comfy. my kind of number! This dress is so beautiful! I really love flowy dresses like this in the Spring and Summer! 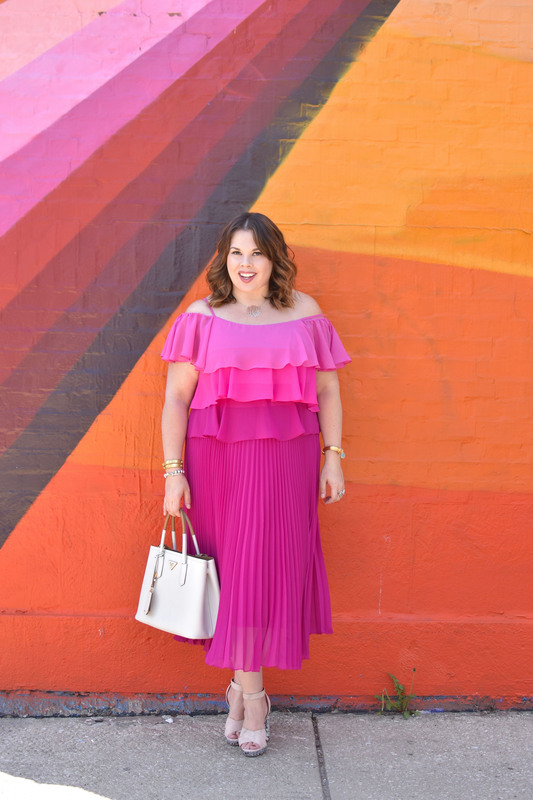 Loving the pink ruffles, Denise! Such a pretty dress on you! those pleats are so dreamy! I am LOVING this gorgeous dress on you! Yes! I love Mean Girls! You look great in this dress! It is gorgeous! 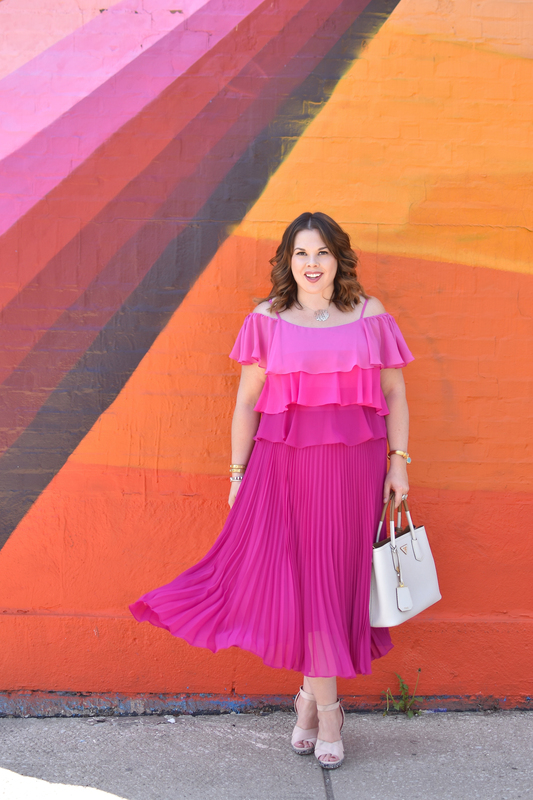 This pink dress is a dream on you! Love the ombre effect with the pink! You look so fab in this gorgeous tiered dress. I’m loving the cut and the color. What a cute ruffled-tiered dress, love to bold color! you look amazing in this outfit! 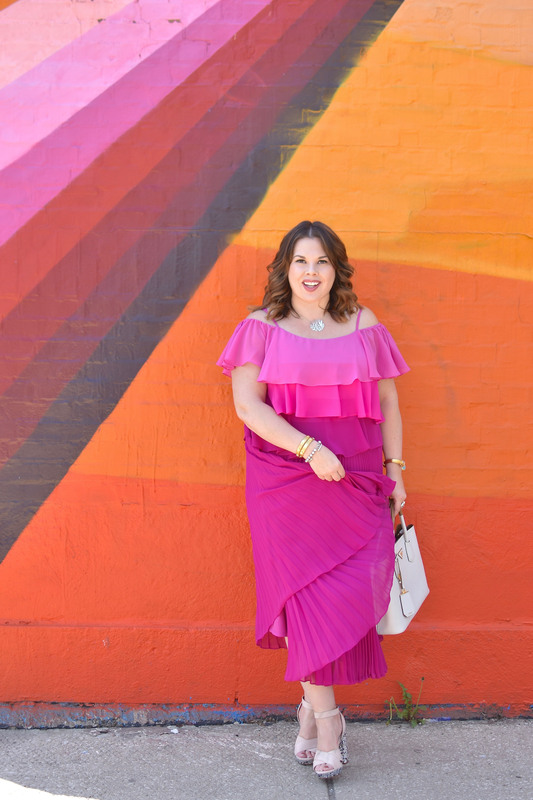 I love love love the pink + ruffle combo!